This picture always makes me smile. 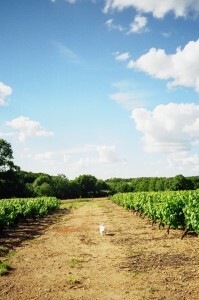 It’s of our Westie, Fred, walking among rows of Muscadet grapes a few years back on a holiday. I like the way he is walking purposefully, as if he knows where he’s going, similar to one of the Wine Dogs. And I like the colours – especially the blue sky, because we didn’t see much of that during our two week stay near Nantes. I’d always wanted to go back to the Loire to revisit happy childhood memories of a magical camping-and-castles family holiday. The added bonus this time was that, as an adult, I wanted to add wine into the mix as well. With pet passports, we thought we could take the dog too. But finding a cottage to rent which takes dogs in that part of France was strangely troublesome. So we ended up a former bakehouse on a farm near Nantes. It rained almost every day. It was unseasonably cold for a June. The bakehouse was poorly furnished in that rural Formica look that the French can excel in. 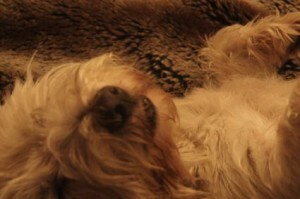 Rat fleas on the farm attacked poor Fred and he was in misery, tearing out clumps of fur. And the local vet reneged on our agreement to issue the documentation to get Fred back to the UK, so we had to find a vet in Cherbourg on a Sunday, which also happened to be Bastille day, to inject Fred again. But when I see this picture, I (almost) forget about all of that. I remember us hurtling down the autoroute to visit Saumur, Angers and Chinon. I remember us taking Fred into the stunning Brasserie La Cigale for oysters and Muscadet (us, not him) and no one turning a hair. Ditto La Toile a Beurre in Ancenis, where this time we were all drenched and were comforted by the most heavenly ile flottante I’d ever tasted. Above all, I remember the wine section of the nearby hypermarket, which focused on local wines, and trying everything. It is because of that holiday that I learnt about how Sauvignon Blanc could taste so different from one end of the Loire to the other, developing a particular liking for Quincy and Menetou Salon. I discovered how Chenin Blanc could range from a fresh, herby-citrus Saumur Blanc to a rich Vouvray through to a sweet, golden Coteaux du Layon. I understood that Cabernet Franc was more than just a workhorse blender, especially in the guise of Bourgueil. Finally, after experiencing the nasty, cheap Muscadet that used to be prevalent in the UK, I learnt that Muscadet did taste of something, especially if it had those alluring words ‘sur lie’. So, despite the misery, when I look back on this holiday I am filled with warm and happy thoughts. A case of rosé-tinted glasses? Perhaps. But I would do it again in a heartbeat. Although this time, I’d leave Fred in the tender care of family back home. I love the great new SipSwooshSpit competition – Spot the Dog! Put your “X” on the coupon where you think the dog might be.